As the McDermott Intern for Gallery and Community Teaching at the DMA, every Friday morning I am lucky enough to lead Go van Gogh® outreach programs in elementary school classrooms across Dallas. 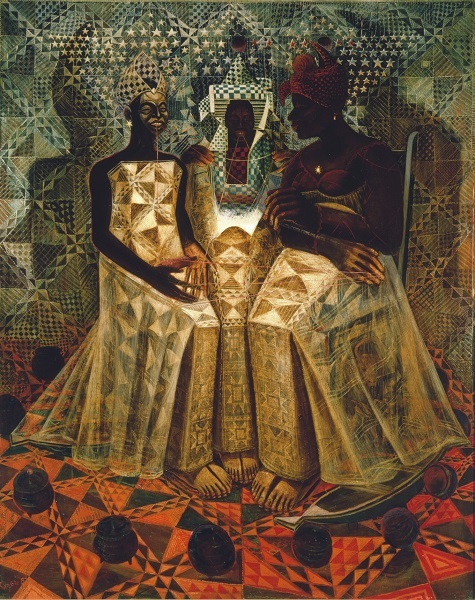 Each lesson is rooted in the DMA’s collection, and one of the works of art that I have grown particularly fond of teaching is a painting called Starry Crown by John Biggers. The patterns of Starry Crown reflect images and symbols from African life and culture. The string held within the mouth of the three women represents the spoken word that passes tradition, knowledge, and history from one generation to another. It is Biggers’ own history—his story—that, to me, makes this painting all the more significant. John Biggers’ story begins in Gastonia, North Carolina, in 1924. Growing up as a black child during a racially segregated time in the southern United States deeply influenced his perspective of the world. According to Olive J. Theisen’s A Life on Paper: The Drawings and Lithographs of John Thomas Biggers (2006), individuals with darker skin tones were allowed to enter art museums only one day of the week. Although there were talented and skilled black artists at the time, recognition, and thus financial success, was often denied to artists of color. 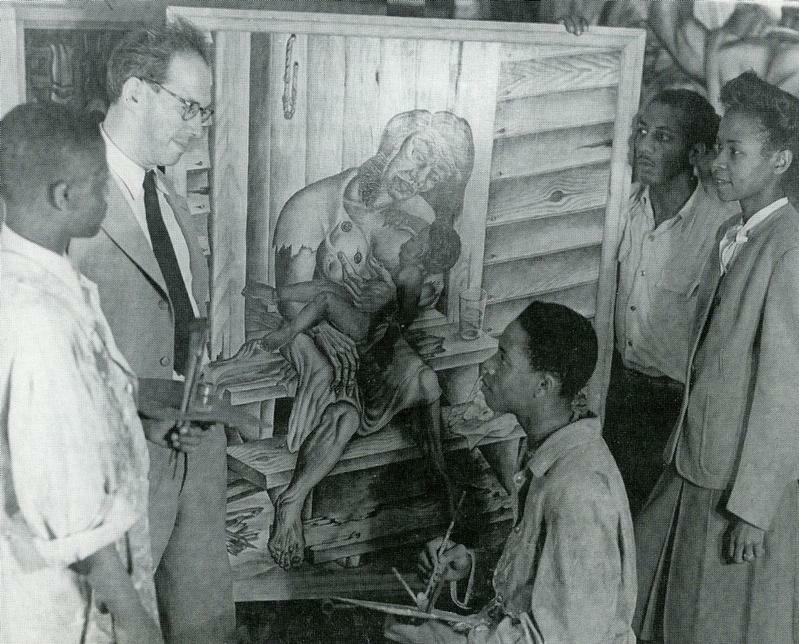 When Biggers entered college at Hampton Institute (now Hampton University) in 1941, he registered with the intention of learning a more practical trade, like plumbing; however, Biggers’ intentions dramatically changed within his first year when an art course taught by Viktor Lowenfeld empowered him to take ownership of the culture and creativity of his own heritage through the arts. With Lowenfeld’s encouragement, in 1946 Biggers left Hampton Institute as a dedicated artist with a clear mission: to tell the honest story of the black American through art—to make the once invisible known and respected. 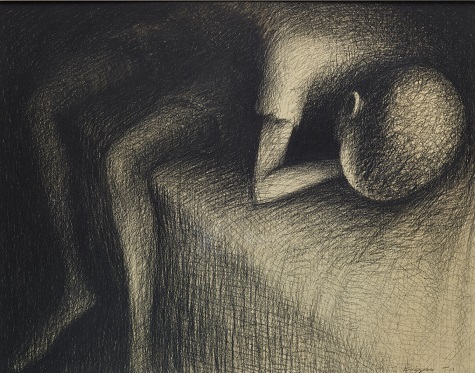 Flash forward to 1952: Biggers submits one of his finest drawings, Sleeping Boy, to the fifth Southwestern Exhibition of Prints and Drawings, sponsored by the Dallas Museum of Fine Arts, the precursor to the DMA. Sleeping Boy was drawn in the doctor’s office on a scrap of paper. I had carried my mama to the doctor’s office, was waiting there, saw a little child asleep on a chair, sketched him on a scrap of paper. When we got home, I immediately transferred the sketch to a large sheet. 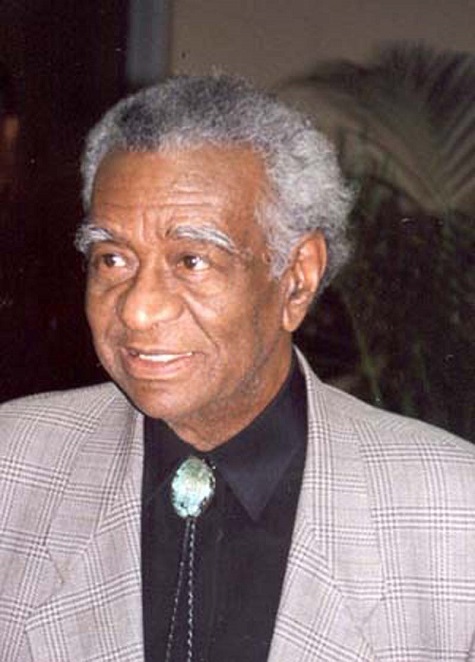 Biggers did in fact win the Neiman-Marcus Prize for drawing and was invited to the Dallas Museum of Fine Arts for the awards presentation; however, as noted by former DMA staff member curator Philip Collins, once the committee discovered that Biggers was black, his prize was handed to him without ceremony at the Museum’s door. This was Biggers’ first experience with the Museum. Thirty-seven years after this incident, his painting, Starry Crown, was shown as part of the Black Art, Ancestral Legacy exhibition in 1989. During the opening, Biggers not only received red carpet treatment, but he also gave a talk—a talk that was prefaced with his very first experience at the DMA. The knowledge of Biggers’ history with the DMA makes presenting Starry Crown to students that much more meaningful to me. By teaching this work of art with the artist’s story in mind, I encourage tolerance and acceptance for individuals of all backgrounds within the students in Dallas. Angela Medrano is the McDermott Intern for Gallery and Community Teaching at the DMA.